A rainbow-billed toucan is a vibrant sight in the jungle. 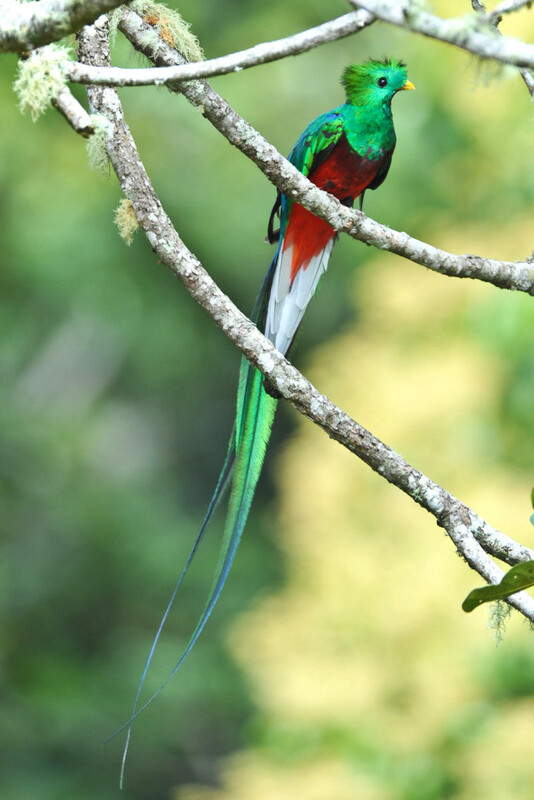 The striking plumage of a resplendent quetzal bird. 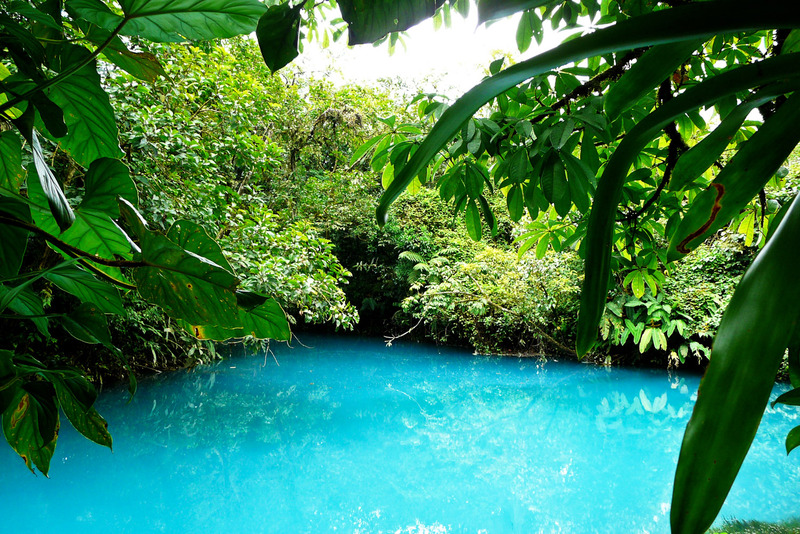 The striking blue waters of the Celeste River at Tenorio Volcano National Park. 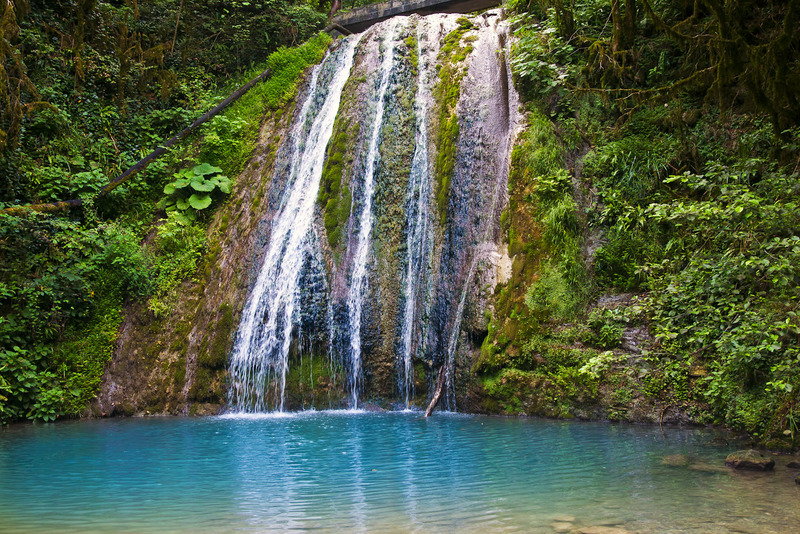 A waterfall on Costa Rica’s spectacular River Celeste. The sapphire hues of the Blue Morpho butterfly. 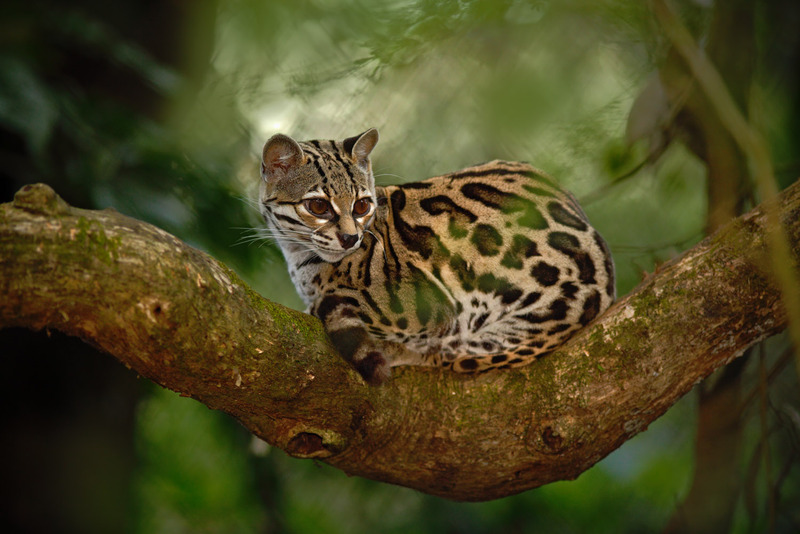 A margay relaxes, one of the country’s many strange animals. 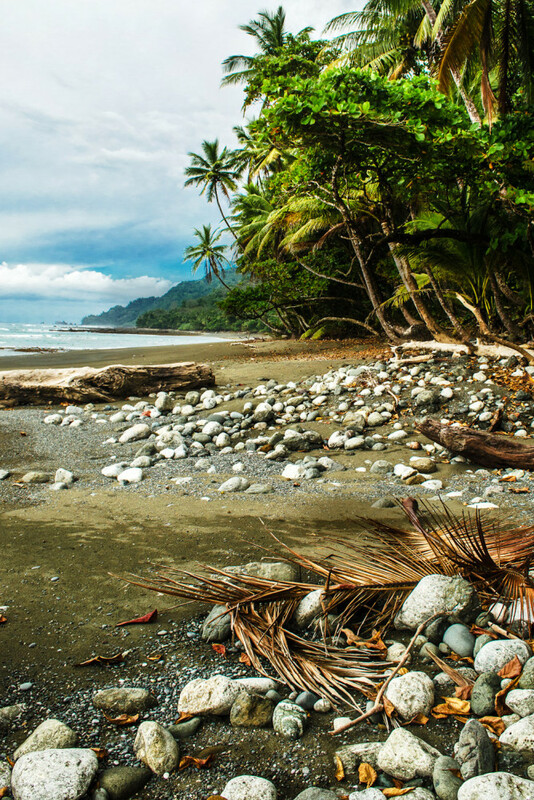 One of the wild beaches at Corcovado National Park on the Osa Peninsula. 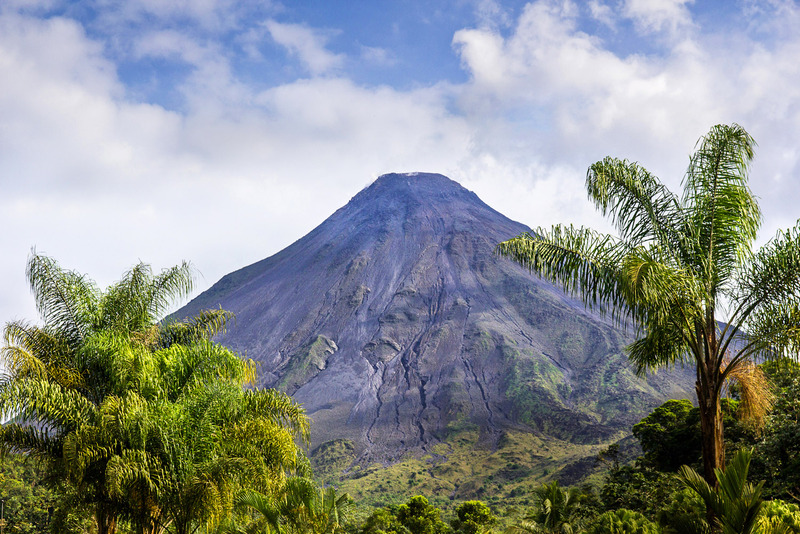 The lush flanks of Arenal volcano. 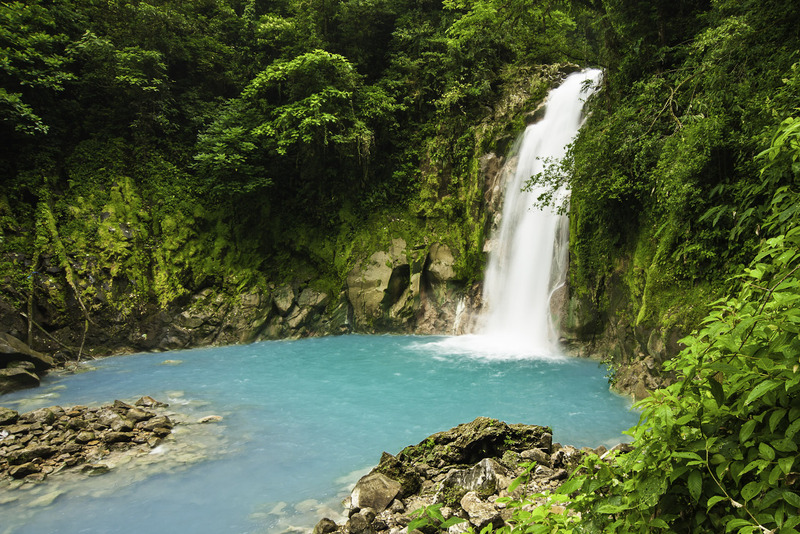 Costa Rica is dotted with beautiful lagoons and waterfalls. Sulphur and white breasted toucan. Wisps of golden dust hung like halos around the last few struggling shapes that were still kicking in the sand. A hundred satisfied vultures bickered half-heartedly among the spoils, already almost too fat to fly, and in the shadows of the palms I could see the skulking forms of prowling coyotes. Farther along the wide arc of sand a few latecomers to the invasion were crawling in a desperate retreat to the sea. But this was no battleground and despite the presence of so many scavengers the drama that had unfolded the previous night was more one of life than of death. I’d arrived on Nancite Beach in Costa Rica’s remote Guanacaste province the night before one of the biggest arribadas of recent years. Costa Rica has given the Spanish word arribada (literally meaning ‘coming up’) to the world as a term for the great mass landings of olive ridley turtles that mysteriously and unpredictably make mass egg-laying invasions on the country’s beaches. But Costa Rica’s huge arribadas are surely one of the greatest wildlife spectacles in the world and the sight of hundreds of marine turtles, each weighing up to 45 kilograms, is unforgettable. A busy schedule of assignments had left me with only one night to camp at Nancite but, by pure coincidence, my timing had been impeccable. The night I spent helping the conservation team with a head-count of more than 2400 turtles remains possibly the most dramatic wildlife experience of my life (surpassing even the most dramatic crossings of Africa’s Great Migration). 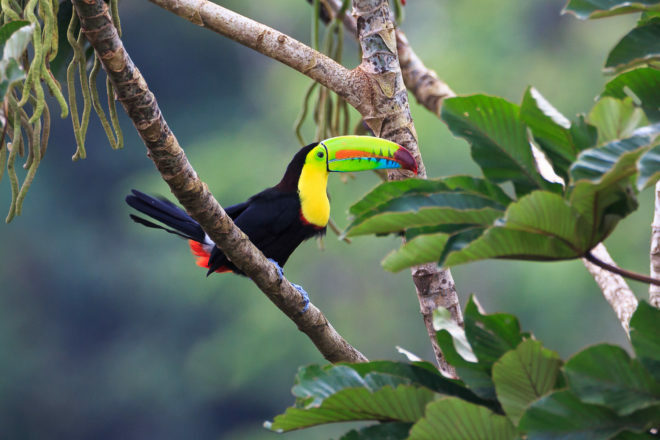 I’d spent a month travelling around Costa Rica and was already enthralled by natural riches that I had never seen matched beyond the greatest national parks of East Africa. While great herds and prowling predators might be abundant in the heart of those parks, you will rarely experience wildlife in an African city or township. In Costa Rica, however, I realised that you can see as much wildlife by simply walking down a rural village street as you can in the best national parks in other countries. 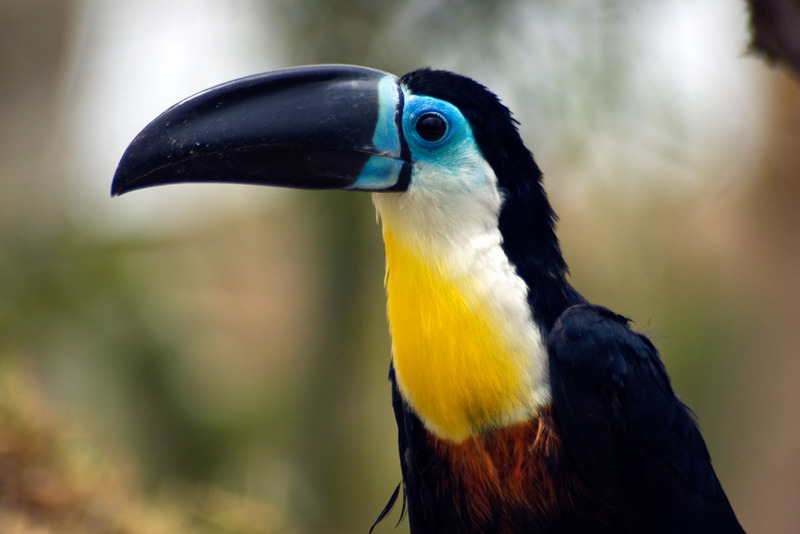 Perhaps due to their famous pura vida (pure life) live-and-let-live attitude, the ‘Tico’ people seem to live hand-in-hand with their wildlife. At one hotel I’d been pelted with mangoes by a troop of bellowing howler monkeys and chased by a giant ctenosaur (like an oversized prehistoric iguana). In various backstreet eating places I’d watched South American coatimundis and raccoons from North America raid restaurant kitchens and I’d defended countless sugar-bowls from cunning magpies and squirrels. 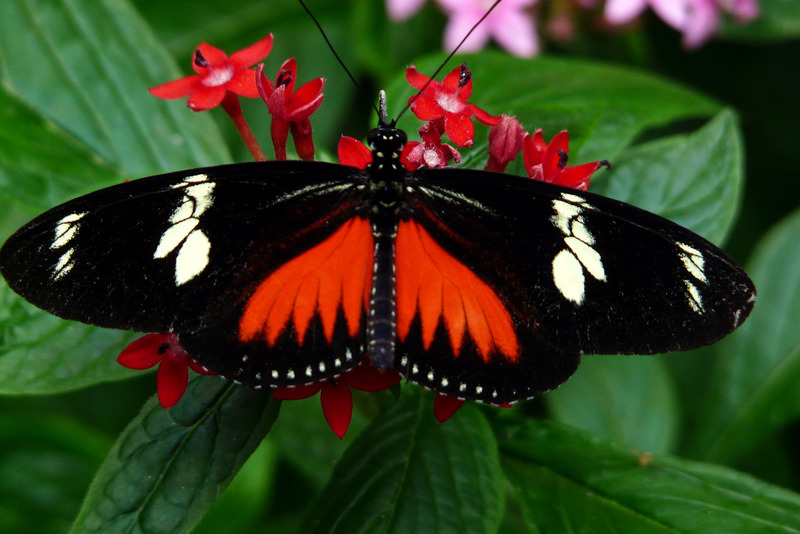 Costa Rica has been described as ‘a mother-lode of eco-diversity, emanating bio waves north and south’. It is part of the land-bridge between Central and South America and is doubly rich for the contrasting species it is home to: southern jaguars and northern cougars, tapirs and otters, sloths and skunks, monkeys and squirrels. Collared peccaries browse with white-tailed deer, kinkajous share the canopy with possums and ocelots hunt with foxes. 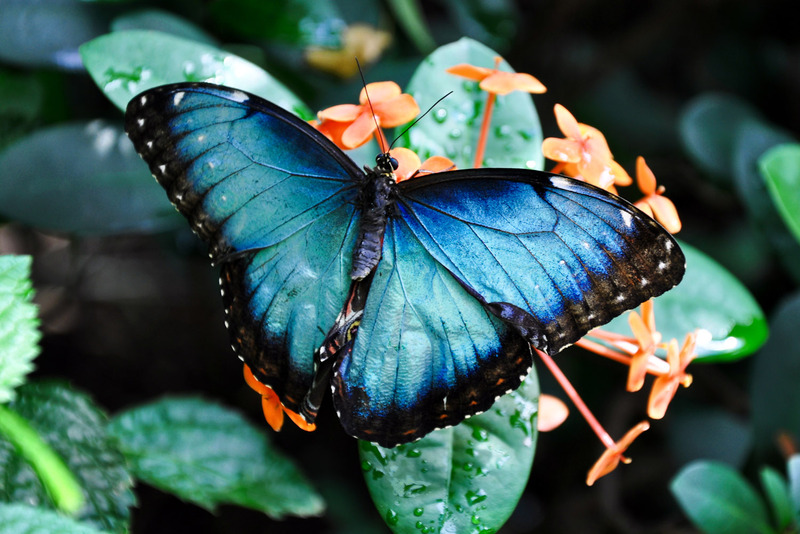 of jewel-like hummingbirds and 1400 butterflies have been listed here, including the magnificent Blue Morpho, which the local tribes once believed to be fallen bits of heaven. 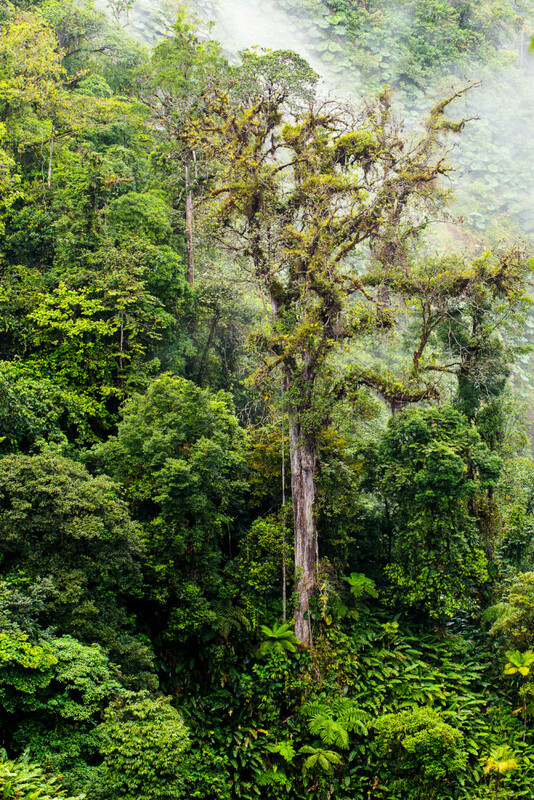 While Costa Rica’s indigenous population has disappeared almost without trace (apart from a very few pre-Columbian settlements), the Garden of Eden that they once called home remains. The country has become one of the shining lights of conservation throughout the world. It’s about a quarter of the size of the state of Victoria (with a similar population) yet more than 25 per cent of the country is occupied by protected wilderness. There are almost 200 national parks and reserves, protecting vast areas of volcanic ranges, cloud forest, paramo (high-altitude moorland), rainforest, wetlands, mangroves, wild beaches, off-shore reefs and some of the world’s last great tropical dry forests. 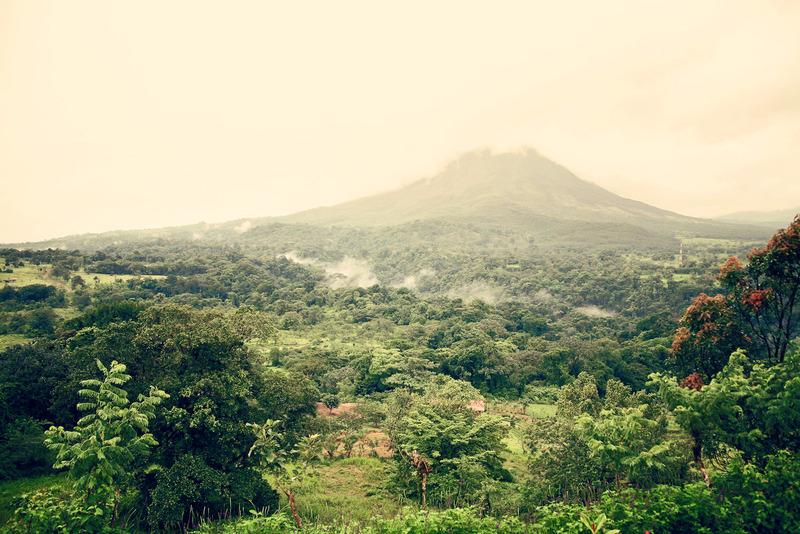 The volcanic highlands ripple down the spine of the country, separating the Caribbean from the Pacific where Nicoya Peninsula and Osa Peninsula hang like swollen papayas from the gnarled trunk of the mainland. Osa Peninsula was once an untamed wilderness, infested with jaguars and home only to a few desperado gold prospectors, but these days it is a land where there is an uneasy truce between local ranchers and the protectors of Corcovado National Park. National Geographic described Osa Peninsula as ‘the most biologically intense place on Earth’ and I’d been drawn back to the area several times by the sort of wildlife sightings I’d normally consider impossible outside of Africa. 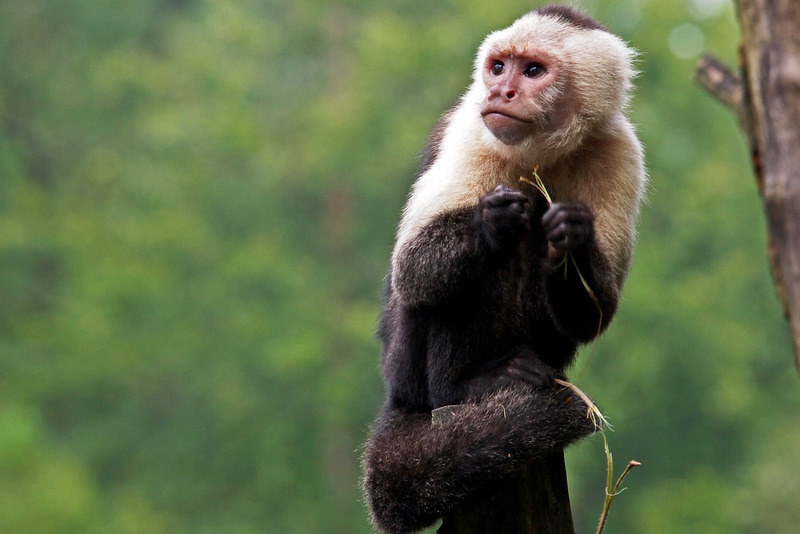 I’d been exploring the jungle since dawn when I was woken by the shrieking calls of a troop of cheeky capuchin monkeys that had come down onto my balcony. Even the restaurant at Lapa Rios Eco Lodge is a wildlife corridor, used by macaws, monkeys, coatis and even anteaters making their way along the ridge. I breakfasted on fresh fruit while humpback whales made their dawn arrival in the bay far below, and headed into the park itself along a deserted beach where I paused to protect a few tiny turtle hatchlings from the attentions of a hungrily wheeling kite. Basilisks – known sometimes as Jesus lizards for the way they’re able to run across water – took flight in front of me and raced comically away on their back legs. Wildlife is omnipresent in Costa Rica and although all of these sightings caught my attention, this morning my focus was on bigger things. I’d come to Corcovado National Park specifically to look for jaguars. Not many people have seen this most elusive of big cats in its wild habitat and I was aware that my chances were slim. However, my two guides Aida Bustamante and Ricardo Moreno were among the most experienced jaguar specialists in the world and have spent more than a decade combing the jungle in pursuit of Central America’s super-predator. We’ve already tracked a tapir in the hope that a jaguar might be tracking it too. It was an old battle-scarred male, now weakened by age and forced into the shelter of a swamp where he could hope to stave off the attentions of the local cats for at least a few days more. No jaguar materialised. Within an hour we are lying flat on our bellies on a jungle track as a scampering troop of coatimundis (one of the jaguar’s major prey species) snuffles around us. I’m aware that even coatis are apt to be vicious if, like these, they have babies to protect. But the reason that my heart is hammering is not because of the proximity of these cute pointy-nosed mammals. I had trekked enough among big cats (in India, Indonesia and many parts of Africa) to know that attacks are rare. However, in the few cases that humans have been attacked by big cats it is almost invariably a case of mistaken identity. And, grovelling as I was on the jungle track, I was aware that I was doing a very good impersonation of some sort of particularly helpless prey. The king of the Central American jungle does not have to show himself on demand, however, and although I’d been lucky with the turtles, it was with mixed feelings that Aida, Ricardo and I eventually picked ourselves up from the jungle floor and admitted defeat. Much as I wanted to stay longer exploring the jungle I had come to see as one of the world’s greatest wildlife destinations, it was time to move on… and I was equally sure that I didn’t want to remain a potential part of the food-chain. Delta Air Lines runs regular flights from major Australian cities to the capital of Costa Rica, San José, via Los Angeles. Lapa Rios Eco Lodge is a member of National Geographic’s Unique Lodges of the World. They offer double bungalows from $426 per night per person, including three meals per day, transfers from the local landing strip at Puerto Jiménez and a selection of tours led by expert English-speaking guides.